Manufacturing jobs have been on a steady decline for several years because of trade deals, technological advancements and economic recessions. Despite this, manufacturing remains one of the most important sectors of the U.S. economy, employing more than 12 million workers, or about 9% of the total U.S. employment. American cities continue to spend billions each year to buy major equipment, such as buses and railcars for public transportation systems. This spending has the potential to support tens of thousands of good manufacturing jobs. According to the Institute for Women’s Policy Research, there will be 533,000 good middle-skill manufacturing jobs available over the next decade. Jobs to Move America is working with labor, business, community and governmental groups around the country to ensure money spent on building transportation infrastructure is also used to promote equity and bring manufacturing jobs back to the United States. The organization also is advocating for workforce development and training programs that prepare working people for high-skilled careers that will help them succeed in the 21st-century economy. Jobs to Move America and community partners recently managed to ensure a project in Chicago will create good jobs and long-term economic opportunities for the community. JMA worked with the Chicago Federation of Labor, the city of Chicago and the Chicago Transit Authority for four years to ensure that the U.S. Employment Plan was included as part of the CTA’s latest $1.3 billion project, which will supply up to 846 new railcars and replace about half of the CTA’s current fleet. The employment plan is a toolbox of policy resources transit agencies can include as part of their request for proposals to encourage bus and rail manufacturers to train and create good high-skilled U.S. jobs in communities that need it most. The company that won the contract, CRRC Sifang America committed to building a new $100 million unionized facility on Chicago’s South Side, the first in 36 years. The company will spend $7.2 million to train 300 factory and construction workers. Additionally, CRRC has signed on to a community benefits agreement guaranteeing support for South Side residents and is part of a workforce-labor-business consortium that received a $4 million Department of Labor grant to develop an apprenticeship and training program, and a pipeline into manufacturing jobs in Chicago. The work of JMA with labor and community partners leveraged a robust manufacturing jobs program that will strengthen the middle class, stimulate increased investment in new domestic manufacturing facilities, and create opportunities for low-income communities. Most importantly, the Chicago work has set a precedent for the rest of the country, lifting up standards and creating a model for how communities and business can and should work together. The idea behind JMA’s work is simple. There is a need to reframe the discussion about good jobs and economic prosperity away from a “cheapest is best” approach to a broader discussion about the economic impact of using taxpayer dollars to create good jobs, especially for those historically excluded from the manufacturing sector, like women and people of color. Take, for instance, Kristian Mendoza in the Los Angeles area, a veteran who was struggling to find a good-paying job after his service. He was forced to commute to a job an hour-and-a-half each way from his home. The job paid so little he could barely afford the gas to get there and did not have the resources to take care of his two young children. Because of the work of the JMA coalition in Los Angeles, a U.S. Employment Plan was implemented in a project of the Los Angeles County Metropolitan Transportation Authority. Part of the agreement is a community-labor partnership with Kinkisharyo, the company that won that bid. The company committed to hiring and exploring skills training for disadvantaged U.S. workers. To date, the company has exceeded its commitments, employing some 400 workers, most of whom are people of color in a unionized factory. Mendoza is one of the 400. After struggling for years, he has been able to move out of his family’s home and into a place close to the Kinkisharyo factory. The JMA team is now working on multiple projects across the country, monitoring the industry for upcoming opportunities to maximize public transportation dollars and ensure there are more success stories like Mendoza’s. This blog was originally posted on aflcio.org on April 12, 2017. Reprinted with permission. 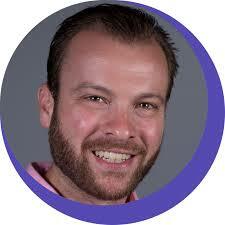 Alaa Milbes is the Senior Communications Specialist for Jobs to Move America. 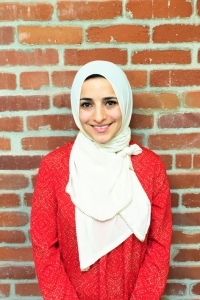 Prior to joining JMA, Alaa served as Oxfam’s Media Officer in Jordan for the Syria crisis response on a short-term assignment, where she worked on a number of media strategies and campaigns meant to raise awareness about Syrian refugees. Alaa also did communications work for the United Nations Relief and Works Agency for Palestine refugees, covering 5 regional offices in Jordan, Lebanon, Syria, and the occupied Palestinian territory. 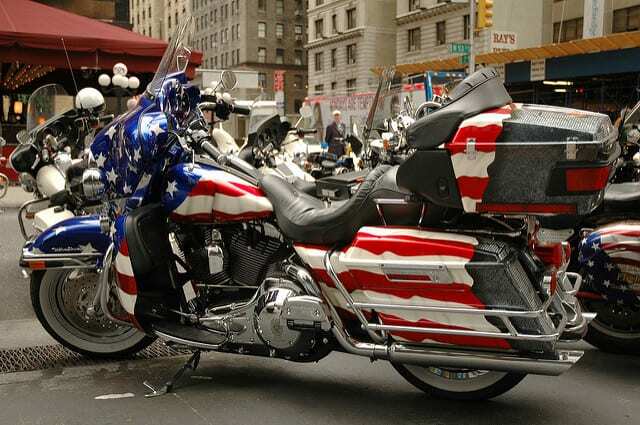 President Donald Trump had Harley-Davidson executives and employees over to lunch at the White House last week and reiterated his promise to end wrong-headed trade policies that enable foreign countries to eat American workers’ lunch. Trump reassured the Harley workers from the United Steelworkers (USW) union and the International Association of Machinists (IAM) that he would renegotiate NAFTA and other trade deals. No promise could be more heartening to workers as corporations like Carrier and Rexnord continue to move jobs to Mexico. No news could be better in the same week that the Economic Policy Institute (EPI) released research showing that since 2001, the United States’ massive trade deficit with China cost 3.4 million Americans their jobs. Workers, families and communities have suffered as trade and tax policy over the past quarter century encouraged corporations to off-shore factories and jobs. Flipping that philosophy to favor American workers and domestic manufacturing is exactly what labor organizations like the USW have long fought for. If Trump actually achieves that, all Americans will benefit. In the meantime, Rexnord Corp. has finalized plans to uproot its bearings manufacturing machines in Indianapolis, transport the equipment to Mexico and throw 300 skilled and dedicated workers, members of my union, the USW, into the street. Terminations begin Feb. 13. Automation did not take these workers’ jobs. The lure of dirt-cheap wages in Mexico and tax breaks awarded for the costs of moving jobs and machinery stole them. Trump talked to the Harley workers and executives about changing tax policy. Ending all special tax deals and loopholes that corporations like Rexnord and Carrier use for shuttering American factories and shipping them to other countries would be a good first step. U.S. policy shouldn’t reward corporations like Rexnord and Carrier that profit from exploiting the international wage race to the bottom and the wretched environmental regulation of emerging nations. The next logical step would be establishing consequences for those corporations — like requiring them to pay substantial economic penalties if they want access to the U.S. market for their once-domestic and now foreign-made products. In addition, American policy must be — just as Trump promised in his campaign — to stop trade law violators who are trampling all over American workers. The EPI study detailed the devastation caused by the worst violator — China. American workers and companies can compete on a level playing field with any counterpart in the world. But the EPI study shows just how much American workers and their employers suffer when the United States fails to strictly enforce international trade law. 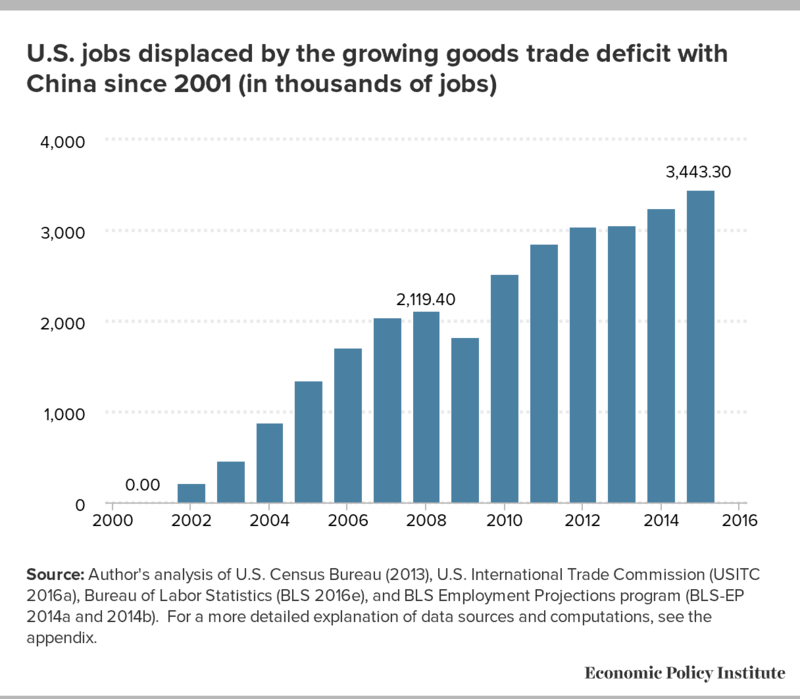 Of the 3.4 million jobs lost between 2001 and 2015 because of the U.S. trade deficit with China, EPI found that nearly three-quarters of them, 2.6 million, were manufacturing jobs. Every state and every congressional district was hit. These are jobs fabricating computer and electronic parts, textiles, apparel and furniture. Manufacturing jobs such as these provide family-supporting wages and benefits such as health insurance and pensions. As these jobs went overseas, American workers’ income stagnated while those at the top — executives, 1 percenters and corporate stockholders — benefited. As the rich got richer, the EPI researchers found, all non-college educated workers lost a total of $180 billion a year in income. When the United States agreed to allow China into the World Trade Organization (WTO) in 2001, former President Bill Clinton said the access that the deal provided American companies to the gigantic Chinese market would create jobs. Promises, promises. It’s possible no one guessed just how massively China would violate the trade rules it agreed to abide by under the WTO pact. Numerous investigations by the Department of Commerce have found China improperly subsidizes its exports by providing artificially cheap loans, free land, and discounted raw materials and utilities. To keep its workers employed, China helps finance overproduction in industries like steel and aluminum, then dumps the excess at below-market prices in the United States, bankrupting mills and factories here. China pirates innovation, software and technology from foreign producers. To steal trade secrets, its military hacked into the computers of American corporations and the USW. In addition, China has manipulated the value of its currency so that its exports are artificially cheap and imports from the United States are artificially expensive. Even if the scale of violation was underestimated, when it occurred, the American government had a responsibility to take action, to file trade cases, to take issues before the WTO, to negotiate to bring China in line with international standards and protect American jobs and preserve domestic manufacturing, which is crucial to national defense. Precious little of that occurred. The trade deficit with China exploded, obliterating American jobs — a quarter million on average every year since China joined the WTO in 2001. China exports to the United States its overproduced aluminum, steel and other commodities, but also its unemployment. American workers and domestic manufacturers already are competitive. What they need is a government that doesn’t require them to compete with a handicap so huge that it’s like asking Evel Knievel to jump his Harley-Davidson XR 750 over 19 cars without a ramp. What they need is tough action against corporations that renounce their birthplace for profit and against flagrant, job-stealing trade violators like China. This post originally appeared on ourfuture.org on February 7, 2017. Reprinted with Permission. 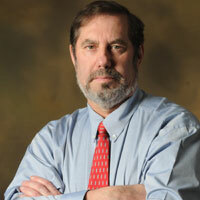 Leo Gerard is the president of the United Steelworkers International union, part of the AFL-CIO. Gerard, the second Canadian to lead the union, started working at Inco’s nickel smelter in Sudbury, Ontario at age 18. For more information about Gerard, visit usw.org. Donald Trump, in what’s been hyped as an “unprecedented” move, has instituted a freeze on the hiring of federal employees. Hyperbole aside (it’s hardly unprecedented, since Ronald Reagan did the same thing on his first day in office), one thing is already clear: this will hurt a lot of people. Trump’s order exempts military personnel, along with any position that a department or agency head “deems necessary to meet national security or public safety responsibilities.” That offers a fair degree of latitude when it comes to filling positions in certain areas. But Trump’s appointees aren’t likely to ask for “national security or public safety” exemptions for the many government jobs that help people in ways Republicans despise. So who stands to lose the most under this hiring freeze? While there may be other reasons for this verbiage, it effectively targets Social Security, which is entirely self-funded through the contributions of working Americans and their employers. Social Security is forbidden by law from contributing to the deficit. It has very low administrative overhead and is remarkably cost-efficient when compared to pension programs in the private sector. That hasn’t prevented Republicans in Congress from taking a meat cleaver to Social Security’s administrative budget. That has led to increased delays in processing disability applications, longer travel times for recipients as more offices are closed, and longer wait times on the phone and in person. Social Security pays benefits to retired Americans, disabled Americans, veterans, and children – all of whom will be hurt by these cuts. OSHA’s employees study injury and illness patterns, communicate safety practices and rules, and inspect workplaces to make sure that the rules are being followed. This hiring freeze will lead to fewer such studies, communications, and inspections. That means working Americans will pay a price — in injury, illness, and death. Some 500,000 veterans have waited more than a month to receive medical care from the Veterans Administration. Nevertheless, White House spokesperson Sean Spicer confirmed that Trump’s hiring freeze will affect thousands of open positions at the VA, including positions for doctors and nurses. The nation’s veterans will pay for this freeze, in prolonged illness, injury, and pain – or worse. Vets will pay in another way, too. Vets make up roughly one-third of the federal workforce, which means they will be disproportionately harmed by this hiring freeze. So will women and minorities, both of whom have a significant presence among federal workers – greater than in the workforce as a whole. Contrary to what many people believe, federal employees are work in offices all across the country. The goods and services purchased by each federal worker provide jobs and growth for their local economies. Cuts in the federal workforce will therefore cause economic damage all of the states where federal jobs are located. According to the latest report on the subject from the Office of Management and Budget, states with the largest numbers of Federal employees are: California, with 150,000 jobs; Virginia, with 143,000 jobs; Washington DC, with 133,000 jobs; and, Texas, with 130,000 jobs. Other states with large numbers of Federal employees include Maryland, Florida, and Georgia. Demand for goods and services will fall with the federal workforce. So will demand for workers, which means that wages will rise more slowly (if at all). This hiring freeze will affect small businesses and working people in states like Texas and all across the country. The “public safety” argument could also be used to exempt employees of the Environmental Protection Agency from the hiring freeze. But Trump has nominated Scott Pruitt, a longtime foe of environmental regulation who has sided with some genuinely noxious polluters, to run the EPA. In other words, Pruitt is dirty. It’s unlikely he’ll seek a “public safety” exemption for the inspectors that identify industrial polluters and bring them to justice. So another group that will suffer under this freeze, without getting too cute about it, is pretty much anybody who drinks water or breathes air. That covers just about everybody. This is not an all-inclusive list. We’ve left out tourists, for example, who’ll pay the price for staffing cuts at the nation’s monuments and national parks. But the overall impact of Trump’s hiring freeze is clear: it shows a reckless disregard for the health, safety, and well-being of the American people. That’s true, in one way. The 10,000 to 20,000 jobs affected by this freeze pale in comparison to the federal government’s total workforce of 2.2 million. But Trump’s just getting started. His memo instructs the Director of the Office of Management and Budget to come up with a broader long-term plan for reducing the federal workforce through attrition. And Trump’s choice for that job, Rep. Mick Mulvaney, is a far-right Republican who’s been fighting to cut the federal government for years. This freeze is a bad idea, but there will be more where this came from. This article originally appeared at Ourfuture.org on January 26, 2017. Reprinted with permission. The U.S. Census Bureau reported Friday that the October trade deficit rose to $42.6 billion from a enormous and humongous 36.2 billion in September. That’s a 17.8 percent increase. October exports were down $3.4 billion and imports were up $3.0 billion. The goods deficit with China also increased, hitting $28.9 billion in October. “The trade deficit is a drag on growth and jobs in the goods-producing sector. It is one signal of weakness that speaks to our challenges in global competition. A trade deficit drains jobs, communities, tax revenues, and entire industrial ecosystems. A trade deficit is a deficit in people’s jobs and livelihoods. Forty straight years of trade deficits was also forty straight years of a system that treated working people like “economic units” to be used up and discarded instead of treating people like people. So the people finally reacted. Forty straight years of trade deficits is a big part of what led to Trump. I’d phrase it this way: are people just like a barrel of oil? In the abstract models of trade economists, commodities like oil will always get sold at some price, they will get to where they need to get to do so, and they’re largely indifferent on the process. Even when commodity markets are off, oil can sit in tankers floating in the ocean waiting out price moves, and it makes no difference to the oil. Oil doesn’t experience unemployment as the most traumatic thing that can happen to it. Oil moves magically to new opportunities, unlike people who don’t often move at all. A barrel of oil doesn’t beat their kids, abuse drugs, commit suicide, or experiencing declining life expectancy from being battered around in the global marketplace. But people do, and they have, the consequences persist and last, and now they’ve made their voices heard. It’s the the dark side of Polanyi’s warning against viewing human being as commodities. Representatives Dan Lipinski (D-IL) and Mo Brooks (R-AL) have filed a House Resolution (H.Con.Res.175) to make balanced trade a national goal with a special emphasis on manufacturing and goods. … That it is the sense of Congress that Congress and the President should prioritize the reduction and elimination, over a reasonable period of time, of the overall trade deficit of the United States. There’s nothing wrong with that. The Coalition for a Prosperous America (CPA) is “a nonprofit organization representing the interests of 2.7 million households through our agricultural, manufacturing and labor members.” CPA focuses on trade issues and promotes balancing trade. CPA is sending out the word to Click here to tell your Representative to sign on to the Lipinski/Brooks balanced trade resolution. This post originally appeared on ourfuture.org on December 6, 2016. Reprinted with Permission. Dave Johnson has more than 20 years of technology industry experience. His earlier career included technical positions, including video game design at Atari and Imagic. He was a pioneer in design and development of productivity and educational applications of personal computers. More recently he helped co-found a company developing desktop systems to validate carbon trading in the US. On Thursday, President-elect Donald Trump traveled to the Carrier factory in Indianapolis, Indiana to tout the deal he helped orchestrate to keep about 800 manufacturing jobs in the United States in exchange for state and federal incentives, including $7 million from Indiana. “Companies are not going to leave the United States anymore without consequences. Not going to happen. It’s not going to happen, I’ll tell you right now,” Trump said during a speech at the factory. 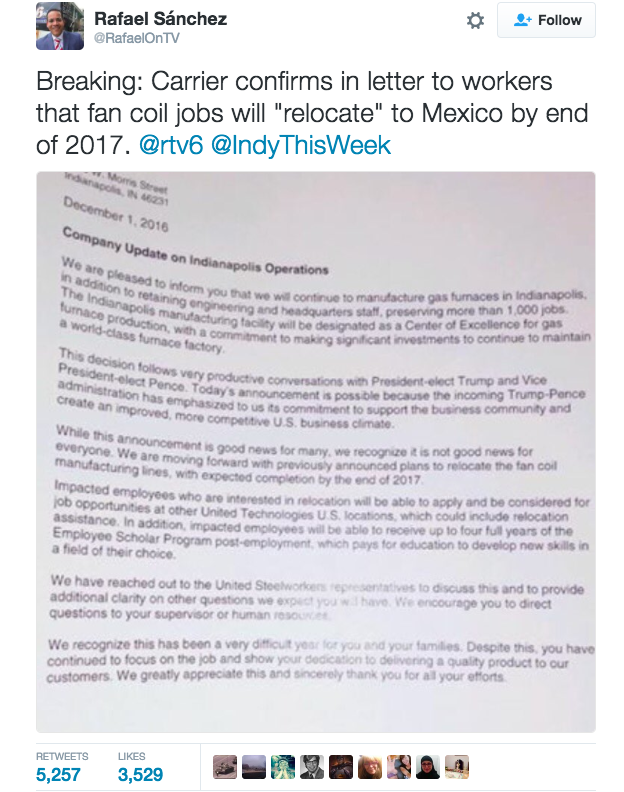 What Trump didn’t mention, either then or during a subsequent “thank you” rally later Thursday in Cincinnati, is that the deal he and Vice President-elect Mike Pence helped broker won’t prevent Carrier from outsourcing more jobs than are being saved in Indiana. The company will keep about 800 jobs at the Indianapolis plant, but will still move 600 jobs from Indianapolis to Mexico. Another 700 jobs are being moved to Mexico from a separate factory in Huntington, Indiana, which will be closed. In sum, about 800 American jobs are being saved, but another 1,300 are disappearing. Those painful details were acknowledged in a letter Carrier sent to affected workers on Thursday that was posted to Twitter by Indianapolis-based journalist Rafael Sánchez. Trump’s deal with United Technology, the company that owns Carrier, is good news for the workers who will keep their jobs, of course. But doling out huge tax breaks and other incentives to entice companies to keep jobs in the United States is bad economics, as Trump himself acknowledged on the campaign trail when he denounced government officials for believing that providing economic incentives to corporations keeps jobs in the United States. During a Thursday appearance on CNBC, conservative economic policy analyst Jimmy Pethokoukis went so far as to call Trump’s speech at the Carrier plant “absolutely the worst speech” about economics in more than 30 years. On Friday, the latest jobs numbers reinforced that Trump’s Carrier deal comes amid a long-term downturn in manufacturing jobs in the country. While a net 178,000 private and public positions were added in November and the unemployment rate fell to 4.6 percent, the lowest since August 2007, manufacturing jobs fell by 4,000. For the year, manufacturing jobs across the country have fallen by 78,000. If the trend continues into 2017—manufacturing jobs in the country have been declining since before George W. Bush took office—Trump would need to strike roughly 100 Carrier-equivalent deals to stem the tide, at an untold cost to taxpayers. This blog originally appeared in ThinkProgress.org on December 1, 2016. Reprinted with permission. Is it patriotic to ship American jobs overseas? President Obama doesn’t think so. He’s right, of course. We live in a globally-connected world, but let’s face it: Home-grown corporations must first focus on their own backyards–a novel concept all to many, it seems. Obama implicitly raised the question yesterday during his Insourcing American Jobs Forum which featured representatives from more than a dozen large and small businesses that have made decisions to bring jobs to the United States and to increase their investments here. Pointing to the CEOs in the room, Obama said they ”take pride in hiring people here in America, not just because it’s increasingly the right thing to do for their bottom line, but also because it’s the right thing to do for their workers and for our communities and for our country. I don’t want America to be a nation that’s primarily known for financial speculation and racking up debt buying stuff from other nations. I want us to be known for making and selling products all over the world stamped with three proud words: “Made in America.” And we can make that happen. I don’t want the next generation of manufacturing jobs taking root in countries like China or Germany. I want them taking root in places like Michigan and Ohio and Virginia and North Carolina. And that’s a race that America can win. That’s the race businesses like these will help us win. Lack of job creation in industries that pay solid middle-class wages is in part behind our nation’s rising inquality, and today White House Council of Economic Advisers Chairman Alan Krueger addressed the issue in detail. TPM’s Sahil Kapur says Krueger blamed inequality on economic policies “tilted to favor top earners — including income tax reforms (presumably during the Bush era) and the ‘drastic cut in the estate tax.’ Central to the message is that inequalities in the system are “jeopardizing our tradition of equality of opportunity,” as Krueger put it. For too long, the 1 percent have sought and received tax breaks that actually created subsidies for corporations exporting good American jobs overseas. America’s workers are not looking for handouts, they are looking for a chance to work hard and apply their best in the world skills in order to provide their families a middle class life. This blog originally appeared in AFL-CIO Now on January 12, 2012. Reprinted with permission. Amid prolonged, painfully high unemployment, ABC News Anchor Diane Sawyer for the past year tirelessly advocated a simple solution—buy American-made products. She clearly explained the reasoning: every American dollar spent on an American-made product helps create an American job. Defying Sawyer’s admonition to search for “Made in America” tags, California set a record for using government money to create jobs in China. The Golden State awarded a contract for the new Bay Bridge that created 3,000 jobs in China for five years—a period during which the state’s unemployment rate persisted at two percentage points above the nation’s already high average. Now there’s an antidote for California’s stupidity. It is legislation called the Invest in American Jobs Act. Championed by U.S. Rep. Nick J. Rahall, (D-W.Va.) and Senators Sherrod Brown, (D-Ohio), Bob Casey, (D-Pa.), and Debbie Stabenow (D-Mich.), it would strengthen existing requirements for buying American products when federal tax dollars pay for construction of highway, bridge, public transit, rail, water systems and aviation infrastructure equipment. To create 200,000 American jobs, Sawyer has challenged Americans to spend just $64 of their $700 in holiday purchases on American-made gifts. Imagine the American jobs that would be created if “Made in America” were stamped on every single part of all $59 billion in infrastructure projects the federal government funds in a typical year. That’s what Rahall, Brown, Casey and Stabenow want. Unless American-manufactured components aren’t available or would be outrageously more expensive, these lawmakers believe American tax dollars should buy American jobs while financing American infrastructure. So they propose to expand the existing “Buy American” requirements and close loopholes that allow governors like California’s Arnold Schwarzenegger to circumvent the rules. Schwarzenegger contended that California would save $400 million on the $5.1 billion Bay Bridge if it hired a Chinese firm to build steel decking and a 52-story tall support tower and ship them 6,500 miles to San Francisco. This turned out to be a “you get what you pay for” lesson for California. The state should have been forewarned by years of publicity about problems with Chinese-manufactured products. For example, toxic drywall imported from China sickened American homeowners, corroded pipes and resulted in hundreds of millions in successful damage claims against the Chinese firms that fabricated it. Or there was the tainted blood thinner Heparin from China that killed at least 81 Americans. In the case of the Bay Bridge, inspectors failed up to 65 percent of welds on the bridge parts manufactured at the Shanghai plant – welds done workers paid $12 a day for laboring from 7 a.m. to 11 p.m. As a result, the state of California and the two American companies it hired to arrange the work, including one ironically named American Bridge, had to send 250 engineers, inspectors and other experts to Chinato monitor the construction. That created American jobs, but imagine the extra cost. In addition, the faulty construction delayed delivery by 15 months. Delays are costly. For example, when the California Department of Transportation (Caltrans) received only one bid to perform the work, the agency said advertising the job again could delay the project by 18 months and add $200 million to the cost. Using Caltrans’ calculation, the 15-month delay added $167 million in extra costs. The price tag on the bridge has risen now to $7.2 billion. The problems in China don’t explain all of that. But there’s no doubt that the $400 million that Schwarzenegger claimed would be saved by shipping the work and the jobs to China has long been overrun by hundreds of millions in extra costs. Organizations like the Alliance for American Manufacturing and the National Steel Bridge Alliance warned of potential problems from circumventing “Buy American” regulations. California ignored them. Also, Schwarzenegger’s estimate that $400 million would be saved failed to account for the wages American workers lost, the taxes they would have paid, or the multiplier effect on the economy when workers spend their wages in their hometowns. In addition, Schwarzenegger’s estimate failed to account for the downside of hiring Chinese workers with American tax dollars, or in this case, bridge toll receipts. That includes unemployment compensation, Medicare fees and other costs borne by governments for joblessness. The Investigative Reporting Workshop at the American University School of Communication included a story about the Bay Bridge project by two-time Pulitzer Prize winning investigative reporters Donald L. Bartlett and James B. Steele in a series called What Went Wrong: the Betrayal of the American Dream. Caltrans argued that no American company had the facilities to perform the work. Hickman said the consortium could have done it. But if government agencies like Caltrans continue to ignore the real costs of shipping work to China, American factories will continue to close. America lost 55,000 manufacturers over the past decade. If that doesn’t stop, at some point, America will forfeit the capacity to perform this kind of work. That would be tragic. It would undermine American strength. Rahall, Brown, Casey and Stabenow are right. American tax dollars should buy American-made products and jobs. And Diane Sawyer is right. Americans should buy American. Here’s a link to her list of American-made gifts and a link to a list by American Rights at Work. This is the antidote for lost factories and jobs. 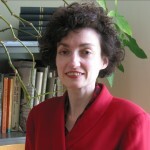 This blog originally appeared in Working in These Times on December 20, 2011. Reprinted with permission. 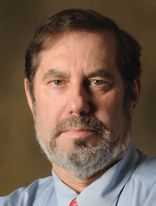 About the Author: Leo Gerard is a steelworker and a Canadian and American labor leader. He was elected president of the United Steelworkers in 2001, and is the second head of union. He is also vice president of AFL-CIO.